Yesterday I walked from the 14th Avenue South Bridge to under the 1st Avenue South Bridge. Walking the trails has revealed many bridge underskirts and this one did not disappoint. For those that live in Seattle, this is also Highway 99 and is where Hwy 509 & 599 join up to cross the Duwamish River. 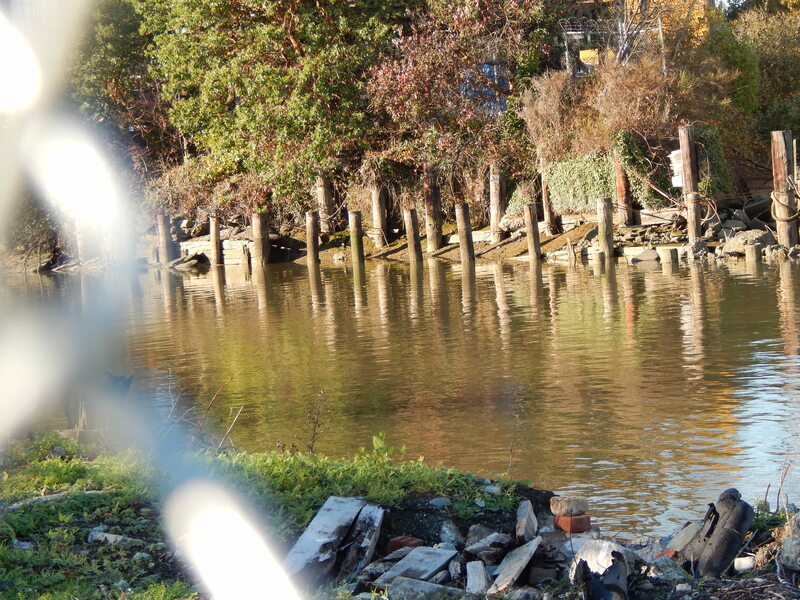 Duwamish Trail – more concrete than true trail. In my study of the river’s original course I learned that the river had a bend here and on both sides of the bridge are small inlets that are remnants of those bends. I got a few photos of one of those that a container company borders. I will post them in a separate post later, but here is a tickler to get your imagination going on what this place looked like more than 100 years ago. (river was dredged in 1913). Under the bridge is a maze of road, ramps, river and industry. At the end of my hike I came to where the container company resides. If you look carefully at the end of the video there is a small building by parked cars. That borders the inlet above. A car inside the chain link fence came out and the motorized gate opened for them. They then drove off as I was taking a short 360 degree video you can see below. Guess they worried I would try to trespass because they came back and waited for it to close.